SEATTLE – An NFL offseason can create almost as much intrigue as the games themselves. So it is with the Seahawks. With a 10-6 record and a playoff spot, their 2018 season was a success by any realistic measure. But Seattle now enters an offseason with no shortage of intriguing questions to answer. Here’s a look at a few of the biggest with our guess at some answers. 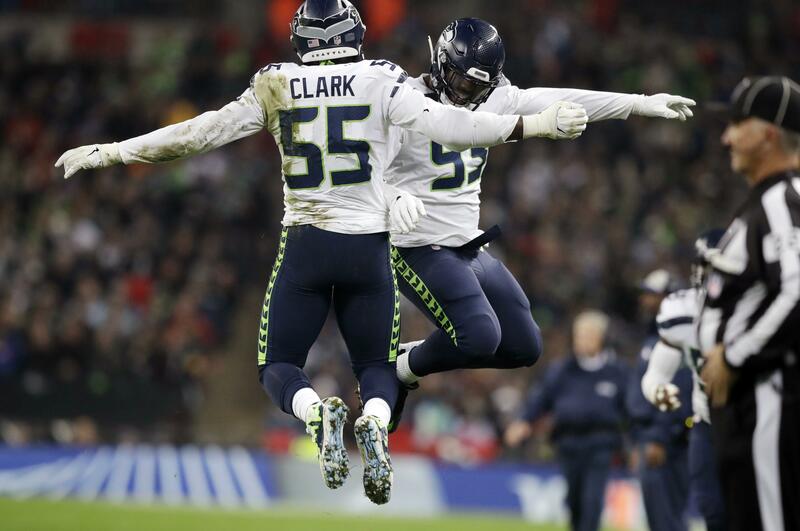 Will the team keep Frank Clark? Yes. The only question is, “How?” – whether it’s via the franchise tag or getting a long-term deal done. Seahawks coach Pete Carroll, often cautious publicly on matters of personnel, has now publicly said at least three times over the past few weeks that Clark won’t get away. It’s also known that the team held a long discussion with Clark shortly after the season. Seattle has not used the franchise tag since 2010, but is willing to do so on Clark, even if it might mean a guaranteed salary of as much as $17.3 million in 2019. Ideally, the team will get a long-term deal done with Clark. The next real deadline to watch is the franchise-tag period, which begins on Feb. 19 and runs through March 5. But it’s also worth remembering that teams can continue to negotiate with players who get tagged. July 15 is the deadline to reach an agreement with a player who is tagged, after which a tagged player can play only on the one-year contract, with no more talks allowed until after the regular season. So the Seahawks could well just tag Clark to avoid him hitting free agency and continue to work on a deal through the spring and summer. Which of the team’s other 13 unrestricted free agents do you think the Seahawks may have the hardest time keeping? Of the significant veterans on the list, the four who may be in the most danger of not returning are linebacker K.J. Wright, cornerbacks Justin Coleman and Neiko Thorpe, and running back Mike Davis. Each appears likely to hit the open market and may command a salaries that the Seahawks won’t be able to match. Each also plays at spots where the team has younger players whom they feel may be able to fill the void for much smaller salaries. Wright, in particular, seems a goner if he is really able to command a salary anywhere near the $6.75 million average of his former deal. Seattle has some other younger corners on its roster such as Kalan Reed and Simeon Thomas who could help make up for the loss of Coleman and Thorpe. And Seattle also has a pretty full complement of tailbacks already to assuage the loss of Davis. Another who may not be back is defensive end Dion Jordan, who played this year on a $1.9 million deal and then had just 1.5 sacks. Given his health issues the Seahawks are not going to want to invest much. But if Jordan gets few offers elsewhere he could be back. And another who almost certainly won’t be back is kicker Sebastian Janikowski, who ranked 23rd in field-goal percentage in the NFL, hitting 22 of 27 (81.5 percent) but more ominously battled a few injuries throughout the year and had a really notable one in the playoff game. Seattle will likely consider younger, more reliable options. First candidate for the 2019 kicking job? Largely unproven former Penn State and Rams kicker Sam Ficken, who signed with the Seahawks on Friday. Seattle may well come to regret choosing Janikowski over Jason Myers, who went on to have a Pro Bowl season. But at the time, going with the known commodity in Janikowski made some sense. What about J.R. Sweezy and D.J. Fluker? The thought is the team wants each back, but within reason. There may be a good chance that the team can re-sign them, however, with each having had some significant injuries in recent seasons. What will be interesting is if either re-signs before the free-agency signing period begins March 13 or if the team lets them hit the market to see what their value is. Will the Seahawks get extensions done with Russell Wilson and Bobby Wagner before the 2019 season? Ideally they will, just to ensure that the two most important players on the team have their futures secured before entering the final year on their contracts. But each situation now comes with some different dynamics than the last time each re-signed in 2015. The team appears willing to use the franchise tag on Wilson – who turned 30 in November – in 2020 if need be, which would ensure he remains with the team until he is into his age-33 season. That prospect could make each side dig in their heels even more. Carroll said Monday that securing Wilson’s future is “very much in our plans” this offseason. But don’t expect any movement on that front until the spring, at the earliest, as the Seahawks will look first to get through assembling the 2019 roster. It’s not thought the team has had any substantive talks with Wilson yet. Meanwhile, Wagner confirmed this week he will serve as his own agent, but use outside help to consult on the legal aspects of negotiating a contract. That will draw comparisons to other Seahawks who have done the same thing – Russell Okung and Richard Sherman – who each did not re-sign with Seattle after serving as their own agents. But in this case, Wagner still has a year remaining on his contract (unlike when Okung did it) and is also not going to be released while recovering from a major injury (as happened with Sherman). Of late, third contracts have proven to be much trickier for Seahawks players to navigate than second contracts. So it will be interesting to see how things evolve with Wagner – who turns 29 in June – through the spring and summer. Wagner has also said he will watch to see how the Seahawks handle Wright. But ultimately, money figures to speak the loudest. At $10.7 million per year, Wagner is currently the second-highest paid middle linebacker in the NFL – behind the $12.3 million per year of Carolina’s Luke Kuechly. He’s likely to want to better what Kuechly got this time around. Is there any chance at all that Earl Thomas returns? There doesn’t seem to be. Carroll gave about as lukewarm a response as possible when asked about him last week and noted several times that he hasn’t talked to Thomas recently, and that Thomas has not been around the team. There seems no realistic thought that the team would offer Thomas any deal prior to free agency that would compel him not to hit the market, and Thomas obviously seems to want to move on. The Seahawks also liked what they saw out of their young safeties this season. Speaking of veteran safeties, it also won’t be a surprise if the Seahawks make an official move to remove Kam Chancellor from the roster this offseason. Salary-cap constraints forced Seattle to keep Chancellor on the roster this season (and he’s not going to officially retire and give up money that is owed him). But the cap situation now changes and the Seahawks will likely want to get him off the books. First, though, the Seahawks could see if Chancellor can pass a physical, at which point they could release him and lessen the salary and cap hits. But assuming he does not, Chancellor will be owed one last check of $5.2 million for the 2019 that is guaranteed due to injury (it becomes fully guaranteed if he is on the roster in the weeks after the Super Bowl). After that, the Seahawks could cut him at any time, owing him no more money. Releasing Chancellor prior to June 1 would clear out $8 million in cap space for 2019 and doing so after June 1 would clear out $10.5 million, according to OvertheCap.com, and in either instance clear out $12 million in 2020, space the team can use for the Wilson and Wagner extensions. Who will be the backup quarterback next season? This is quietly something of an emerging issue for Seattle. The Seahawks did not re-sign 2018 seventh-round pick Alex McGough to a futures contract this week after he spent all season on the practice squad amid some rumblings that McGough is waiting to see what other options might be available, possibly in other leagues but also maybe with teams with a less secure starter. This year’s backup, Brett Hundley, is also now an unrestricted free agent and after having started nine games for Green Bay in 2017 and then not taking a snap for Seattle in 2018, he may also prefer to see whether there are other options that afford him a better chance at playing time. Seattle also isn’t going to want to pay much for a backup quarterback, so if Hundley were to get any sort of offer above the veteran minimum, Seattle would likely not match. The Seahawks have only four draft picks at the moment so a backup QB may have to come out of the veteran and undrafted free-agency ranks. Published: Jan. 13, 2019, 4:57 p.m.